"Art is an abstraction--derive it from nature by dreaming in its presence..."
Being from the Deep South, Kimberly's art is influenced by her life exposed to the Gulf of Mexico and Southern culture. She often celebrates New Orleans as the capital of the Caribbean with her vibrant palette and subject matter. 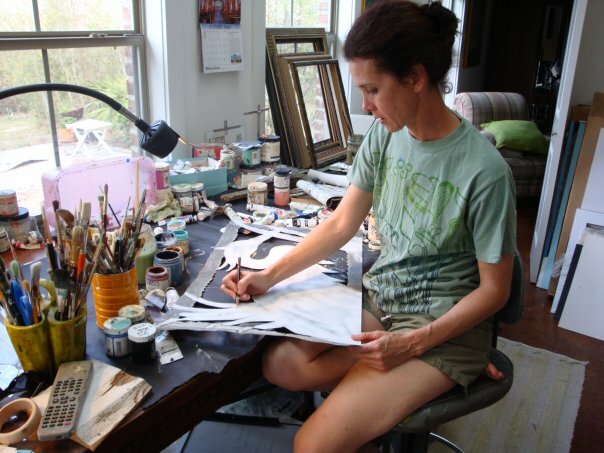 Before becoming a mixed media artist, she was a potter, print maker, and a water colorist. While she no longer displays her works at art shows, she has previously showcased her work at the New Orleans Jazz and Heritage festival and other juried shows across the South. Her work can be found in galleries of several coastal states, commercial businesses and in private collections. Kimberly has been a member of Dutch Alley Artist Co-op in the French Quarter of New Orleans since 2004. Find out when I will be at Dutch Alley, where you can see my work along with 25 other Southern Artists.